A special feature of the Story Starters resource is the range, clarity and depth of vision that the individual scenarios explore. The scenarios give students access to a series of plots and storylines, that can be used either as a story starting devices or explored as oral language activities. This means that you and your students will never run out of topics to pursue. What's more, the free bonuses are specifically designed to prompt and prod your students to explore abilities that may lie dormant within them. Students are presented with opportunities to respond to events in a variety of ways. Imagine you're a mouse. You're about to steal cheese from a kitchen table. You sense movement in the kitchen. You look over the edge of the the table and look down. It's a cat! It hasn't seen you yet, but it can smell your presence. It's searching for you. What in fact would happen next if you're a mouse nimbly eating cheese from a kitchen table, while below a cat searches for you? What do you, a tiny creature, do to save yourself? Do you run to the nearest mousehole, attempt to stealthily sneak past the cat, or do you do something completely unexpected? Your students' responses to this situation may surprise you. Importantly, built into this scenario is the seed of an exciting story. 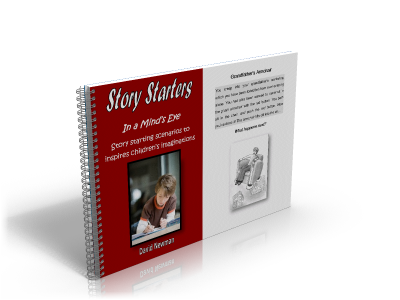 The bonus worksheets - that you receive with the program - are designed to scaffold and shape your students first tottering steps on the exciting journey of building and writing their own stories. The 'How would that feel? 'scenarios are unique. Your students will have a visceral and deeply felt response to the 'How would that feel?' narratives. This happens because your students are placed in the moment, and are prompted to feel a variety of rich sensory experiences. Well, how would that feel? Can you imagine and sense what it is to be a wild horse at full gallop? You can feel the strength in your legs, the pounding of your mighty beating heart, the sound of your pounding hooves, and the wind rippling your mane, can't you? 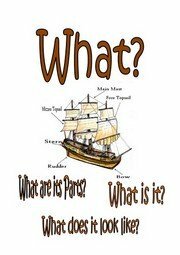 Perhaps the most popular scenarios, and the questions students tend to enjoy the most are the 'Which do you choose and why? narratives. These scenarios position your students in a difficult hypothetical situation and prompt them to choose a course of action. The student is required to think about the implications of his or her actions. If the student chooses to put the dragon into a brief sleep, just how long will the dragon sleep for? Also, the dragon will still be very dangerous when it does happens to wake up. Or, if the student selects the spell to fizzle out the dragon's fire breath, then the wizard still has to contend with the dragon's teeth and claws. Quite apart from the question of which course of action to choose, there are also words such as brief, fizzle, possess, etc, and the meaning of these words within the context of the scenario. The Natural World: The natural world is a place of tooth and claw, but also of incomparable beauty. Science Fiction and Fantasy: Multiple worlds and unlimited situations, which are designed to fire students' imaginations. Flights of Fancy: these scenarios drop students into extraordinary situations to which they have to respond. In History's Pages: These scenarios place the student in the head space of a character sometime in Earth's history. What if..? : These scenarios ask the student to imagine a possible future, which they may encounter. The Nuanced Nudge cards are eight beautiful illustrations that prompt students with where, what, who, when, what color questions. The pictures can be cut out, attached to card, or laminated. Or the cards can simply be read from the sheet. The cards will enhance your students' capacity to adequately answer complex questions. This happens because your students will have increased opportunities to practice their expressive language skills. 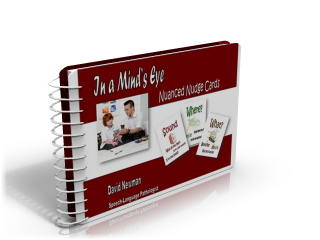 The cards are designed to increase the complexity of your students' verbal response. The In a Mind's Eye worksheets are graphic equalizers that feature worksheets to help scaffold your students' responses to the primary question types: 'What happens next? ', 'How would that feel?' and 'Which would you choose and why?'. The worksheets are an excellent way to help shape and scaffold your students' written language responses to the In a Mind's Eye scenarios. For instance, the 'What happens next?' scenarios, as explained previously, are the seed of an exciting narrative. The worksheets have the necessary blackline masters to guide your students in developing and writing their own stories.